If you play the right strategy then, along with video poker, Blackjack can offer some of the most player friendly odds that you can find in online casinos. However many players give little thought to optimal strategy and often play using their instincts in ways that greatly increase the amount that the house is expected to win so that they would have a far better chance of coming out ahead if they played pure luck games. Many people have the mistaken assumption from watching films such as 21 that the clever player can beat the casino, even online. 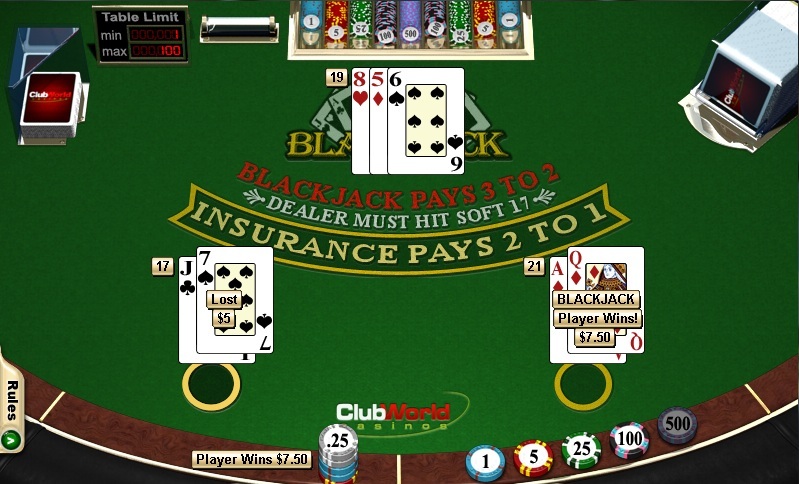 In Blackjack it is possible with optimal strategy and card counting to find situations where the player has an edge over the house. In reality though in most casinos cards are shuffled too frequently for the player to be able to ever have an exploitable edge. With online shuffling it is exceedingly rare to find situations in which the player has an edge over the house but when you gamble you do generally expect to concede a small edge to the house in exchange for the chances to win and the entertainment that you get from your play. The simplest blackjack strategy focuses on when you should hit or stand based on basic odds. Since you can only see half the dealer’s hand, most players automatically assume that the face down card (also called the “hole card”) is a 10. This gives you a hypothetical hand total to beat. Another important factor to consider when deciding whether to hit or stand is at what hand total the dealer will stand. The most common house rules dictate that the dealer stands at either a soft or hard 17. Most basic blackjack strategies encourage players to hit until they also reach the dealer’s stand point, since you know the dealer will hit to beat anything lower. As you can see, there are some scenarios in which you should always choose one move, regardless of the dealer’s hypothetical hand. For example, you will always stand with a hard hand total of 17 or more. Likewise, you should always hit with a hard hand of less than 8. Remember that it’s not possible to bust by hitting with a hand of less than 11, so when doubling isn’t possible hitting is the obvious move. Splitting is also given with Aces and 8s, and doubling down is almost always a good move with an initial hand of 10 or 11. Once you get the blackjack basics down, you can tweak your strategy minutely to improve your odds based on variations in house rules or the number of decks that are being used. Speaking of the number of decks, you might be wondering when we are going to talk about card counting. Learning to count cards would be the next obvious step in strategy for live blackjack players, but online it’s virtually impossible to count cards. You can always find “cheat sheets” available online for which ever rule variation you are playing and most of these are available on the www.wizardofodds.com site. Most modern blackjack games use four to eight decks (called a “shoe”) to discourage card counting, but online casinos take their precautions one step further by usually shuffle up after every hand. Even online casinos that offer token penetration – where they wait a set amount of time before shuffling the decks again – draw from so many decks to begin with that the fluctuations are still too large to give you a realistic card counting advantage. Will playing blackjack disqualify me from a bonus I am playing through? Choose player friendly variations and adapt strategy to the variation you play ie print out and use the right cheat sheet!